The ProZ powwow in Berlin, Germany has been organized by Steffen Walter since before I moved to the area, and it is by far the best such event of its kind I think. Attendees come from far away, in many years from Canada, Mexico and other obscure corners of the world. This year someone even came from Steglitz. Some three, actually, or four if you count the Sheltie. There were few dogs compared with many translators' events; only two in fact. But still, it was a great pleasure to meet familiar colleagues and new ones, one of whom I would like to introduce here. When Anne Plagemann handed me her business card, designed by a friend of hers, the well-chosen colors immediately caught my eye and interest. Then I tried to read it. The small type made it clear that her target customers were ones with excellent vision or at least a current prescription for reading glasses. I'm looking forward to the large print version, which I'll probably pass along to those in need of the kind of services she offers, because she makes a very professional impression and her English is excellent. Then I had a look at her web site. From time to time I like to highlight web sites of colleagues for various unique features or other things which I feel makes them a good example. Anne's site is excellent and very much worth a look. The web design by Franziska Pieloth is very easy on the eye. Ms. Pieloth is a Leipzig-based interpreter with talents that obviously extend beyond her language services. 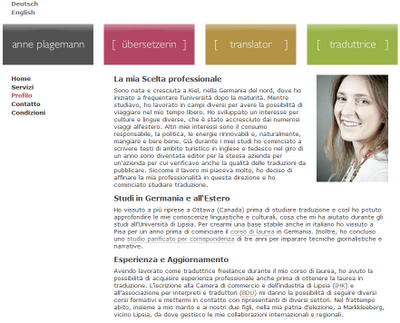 I was particularly pleased by how I could navigate between the three languages of Anne's site by clicking on the colored blocks with the word "translator" in German, English and Italian. But overall the simplicity of the site and the ease with which one can navigate it is very refreshing. I shouldn't be surprised, I suppose. The site designer's degree thesis included an extensive study of the good, bad and ugly practices on the web sites of a great number of fellow freelance language service providers. The lessons learned there were clearly distilled into a good site for Ms. Plagemann.